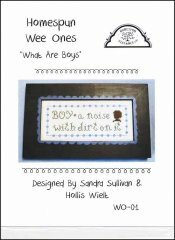 Wee Ones: What Are Boys [C6925] - $7.50 : Yarn Tree, Your wholesale source for cross stitch supplies. A cute design for a boys room. Stitch count 95 wide x 38 high.